Happy Fall, teacher friends! Are you a fan of clip cards?? I sure am, and my students are too! 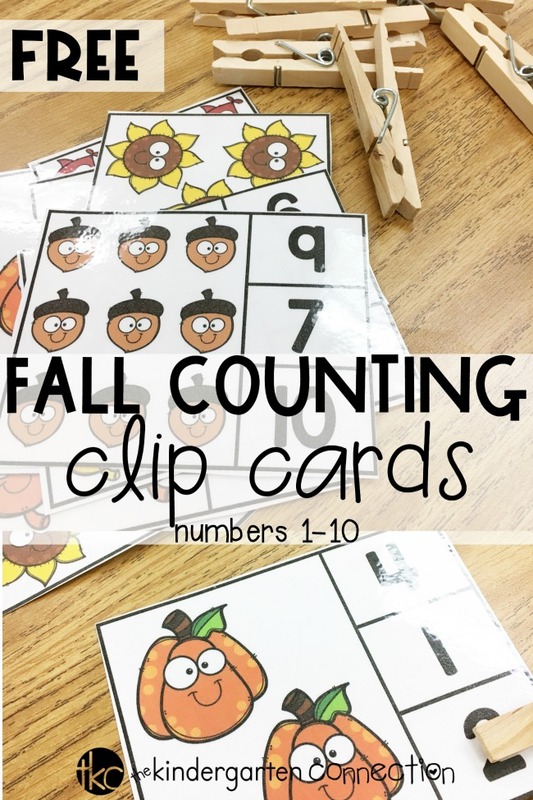 Combine them with adorable fall clipart and it’s the perfect mix for some Fall Counting Clip Cards! 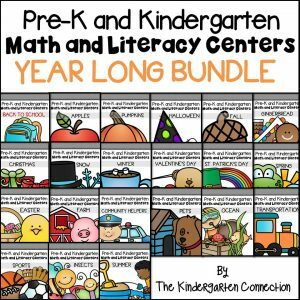 *Pair this with our Fall Centers and Activities for Pre-K and Kinder! These cards focus on counting and number identification for numbers 1-10. 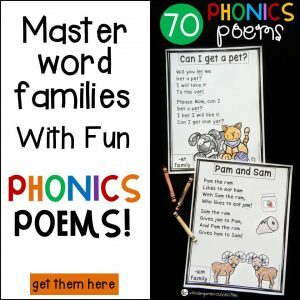 They’re sure to be a great addition to your morning tubs or math centers. If you don’t know what clip cards are, no worries! I’m here to share how they work, give you an alternative way to use them, as well as provide a few ideas to help you support your students. The very first thing you’ll need to do is print these 10 cards and, of course, laminate them for durability. Once you have them ready to go, set them out with clothespins. The objective of using these clip cards is for students to practice counting a group of objects. They’ll need to demonstrate 1:1 correspondence and an understanding that the last number said is the number of objects there are. 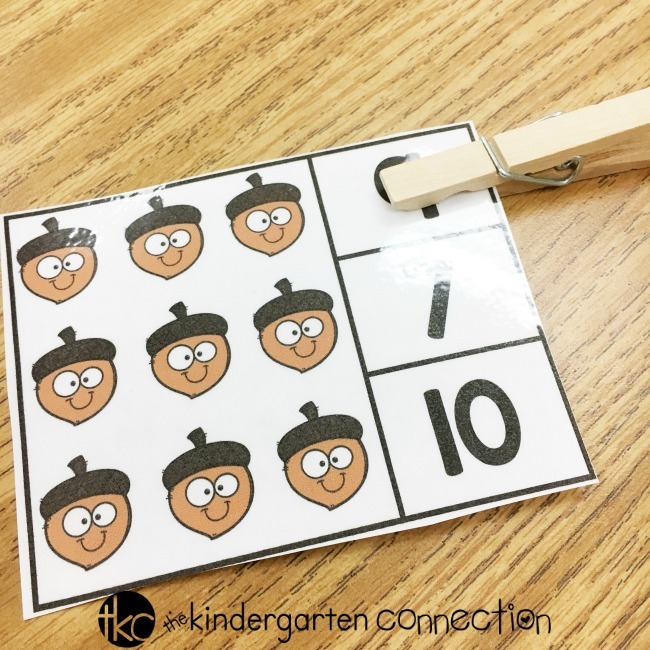 Additionally, by using these clip cards, your students will be demonstrating their ability to identify numbers 1-10. For this activity, students will select a card and count the fall-themed pictures shown the card. Then, they’ll find that number on the card and clip the clothespin to that number. 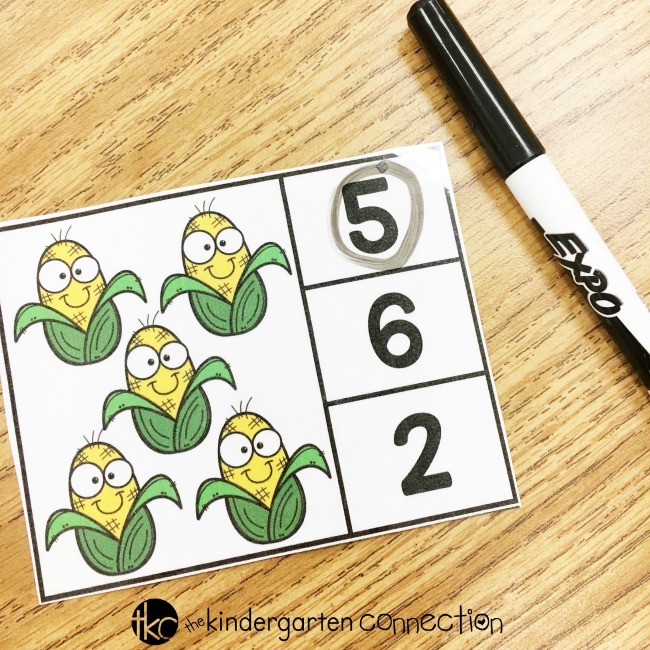 This is a fantastic way to tie in fine motor practice with math. I’m not ashamed to admit that there have been times when I have misplaced (cough, cough, lost) my clothespins. If you find yourself without any clothespins on hand, this alternative idea is the solution you need! Replace the clothespins with dry erase markers. Rather than clipping a clothespin to the corresponding number on the card, students use a dry erase marker to circle the number. For students who need support with number identification: Have a number line on hand. After students count the pictures on the card, they count down the number line until they get to the number they said. For students who need support with 1:1 correspondence: Give them a tool to help them mark or cover up the pictures they’ve counted. One idea would be to have them make a small mark on each picture as they count it. This will help them correlate touching/counting a picture with a number. It will also help prevent them from recounting the same picture more than once. 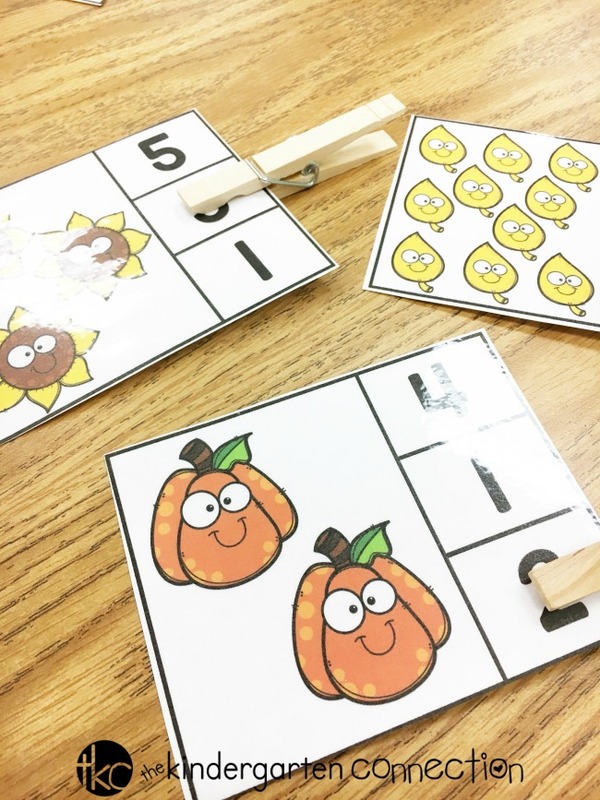 I hope that you and your students love these Fall Counting Clip Cards! 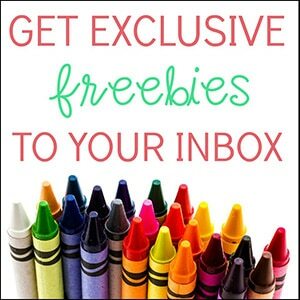 You can grab them for FREE by clicking the large, yellow download button below. 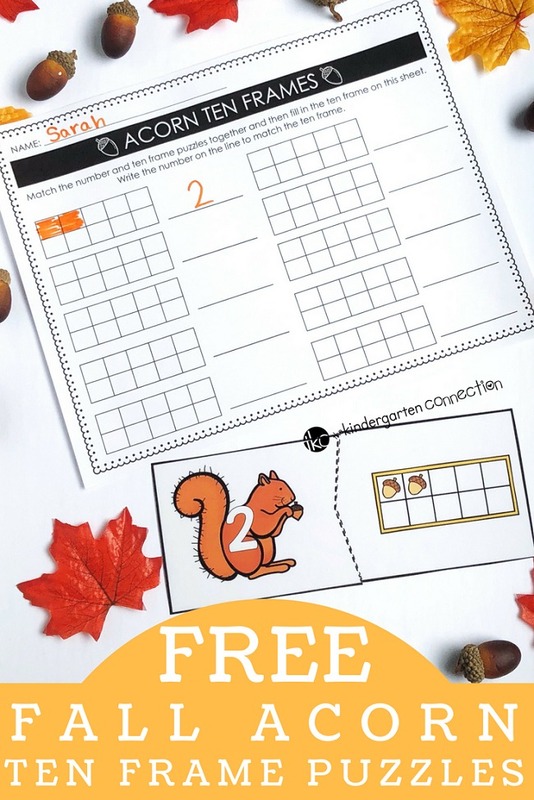 Then, hop on over to see our Acorn 10 Frame Puzzles with Recording Sheet! Stephanie is a Kindergarten teacher who believes that learning should be fun, positive, and student-led. She strives to create a healthy work-life balance with lots of coffee, yoga, and family time. 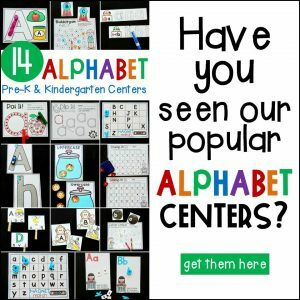 Stephanie shares ideas on how to maximize teacher organization and student independence on her blog, Teaching Little Leaders, Instagram, and Pinterest.